The relationship between pet shops and puppy mills is not always apparent to the consumer. Buying a puppy at your local mall seems like a happy occasion, but each time a person purchases a puppy from a retailer they create suffering that they cannot see. All too many pet shops purchase their stock of puppies from commercial breeders. Dogs were not meant to be mass produced like widgets; they are living creatures. Dogs should not spend their entire existence in a metal cage being bred every time they go into heat. This is exactly what happens to them at the commercial breeding farms known as puppy mills. When you purchase a puppy from a pet store, you have just financed more animal cruelty. The owners of puppy mills prefer to be called commercial breeders. The term puppy mill was coined after World War II when the US Department of Agriculture recommended that struggling farmers should raise puppies. These puppies were kept in such cruel and disgusting conditions that the federal government adopted the Animal Welfare Act. This act authorized the USDA agents to revoke licenses and penalize substandard conditions. Today the problems of inhumane conditions such as exposure, filth, starvation, and injuries left untended still remain. Puppy mills are not in the business of producing happy, healthy puppies that will make great pets. No forethought goes into creating a puppy with the best chance of having a good disposition and being free of genetic defects. The goal of the puppy mill is to make the most money possible from the sale of puppies. You will pay around $800 for a puppy in a pet store. Often these puppies have problems ranging from a minor infestation of intestinal parasites to very expensive health issues requiring complicated treatments such as hip and joint problems, and major organ dysfunctions.Even "clean" puppy mills cannot address the needs of the dogs they warehouse. Dogs have requirements beyond vaccinations and food. 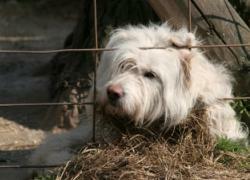 Adequate exercise and socialization to the animals and people they have been bred to live with as pets does not occur. 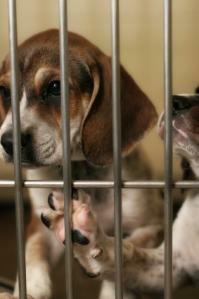 The puppies live in confinement among adult dogs who have lived their lives as breeding stock. The puppies stand in urine and feces and develop unnatural hygiene issues such as defecating in their sleeping area and eating feces. In spite of the fact that there is documented evidence that a puppy mill is not a good place to obtain a puppy, retail pet stores continue to provide an outlet for this cruel practice. Pet stores create a highly visible and appealing market place in which to sell these puppies. Being transported to a pet store is a traumatic and often dangerous part of the farm to market process for puppies from a puppy mill. Puppies are taken from their mothers as early as five weeks of age, loaded into a trailer and hauled via semi truck to pet stores throughout the country. Many of the puppies become ill on their journey, and some die. This is also a negative early socialization experience. It will add to a growing collection of depressing experiences that help form his personality. Less often, the puppies are flown to their destinations via airplane, this experience is only better because it does not last as long. Meanwhile back on the farm, the mother of the "doggy in the window" is in a metal cage, often exposed to the elements being bred over and over again until she grows too old or sick to produce puppies. She will then be taken to auction and sold for as little as $1.00. Purchasing a puppy online is not a good idea, either. Online pet retailers often get their stock from puppy mills, or the puppy mill is selling directly to the puppy buyer via the Internet. Either way, you have increased your chances of buying heartache when you pay money to someone you have not met for a puppy you have never seen. The difficult aspect of the problems created by pet shops and puppy mills is that it is a large issue involving many different interests. One of the largest difficulties of the puppy mill problem is defining the difference between a dog and a chicken in the eyes of the USDA. As it stands, they are both just livestock. To change that will be to open Pandora's Box for the government entities of this country. Due to the sheer number of interests involved, this complex issue is not likely to be solved by legislation in a timely manner. Make pet supply purchases from retailers who do not sell animals.